Life is hard and busy and times are demanding. But to care for our own body and skin is totally in our own hands. 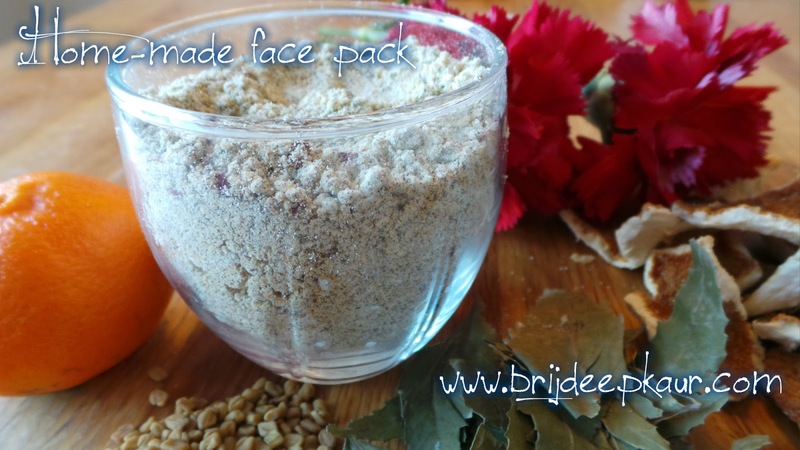 So I have made this natural face scrub and face pack from the ingredients that can easily be found in our kitchen. I make this in batches, enough to last me a month. Every morning before bath, I mix a tsp. or two of this powder with yoghurt and mix well. I mostly use it as a scrub because of lack of time and I get a glowing skin. It can be used both ways: Apply on face and leave on for 15 minutes, carefully remove when dry with fingers and wash with lukewarm water. Pat dry your face. Or apply a layer on whole face, scrub well with fingers in slow circular motion, wash off and pat dry. I use it on my face and neck both. This can even be used as a body scrub. If you have really oily skin, mix this with a bit of milk rather than with yogurt which can make the skin more oily. For dry to normal skin, yoghurt goes best. This cleans the pores and leaves a fresh looking skin. Here I share the method how I make it. I do not take anything in very specific measurements, just measure roughly and add, because there is no ingredient which can harm the skin in any way; unless you have allergies from any of these; of course. Please avoid using any of the ingredients you are allergic to or consult your dermatologist. Grind the dried orange peels in a normal mixer till it is smooth and powdery. Remove any bits that remain un-ground. Mix with gram flour and wheat flour and mix well. Add neem leaves, masoor dal, fenugreek seeds and chana dal to the mixer and grind to a smooth powder. I use only 1 tsp. of each dal and fenugreek and neem leaves just in rough proportions. Add to the flour and orange mix and mix well. Add the crushed rose petals, mix everything evenly and store in an airtight container. This mixture doesn't go bad as only powdered ingredients are used, but it's best to make a batch which lasts for about 4 weeks and make a fresh batch again. 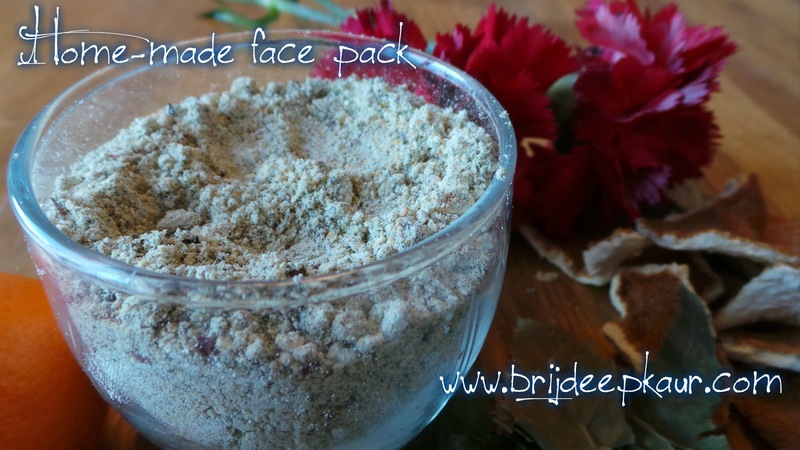 When I shared this face pack and scrub recipe with my friends and followers, I got a lot of queries. So I'm updating this post with all the queries my friends had. For normal and dry skin, mix this pack in yogurt (curd) and use as a scrub or a face pack. Keep for 15 minutes or until dry as a face pack. Wash with lukewarm water. For oily skin, mix this in a little bit of milk. You can also mix this in water or even rose water if you don't want or can't use milk for any reasons. This pack can be used for every type of skin, sensitive and acne pron skin as well, but please remember to not scrub too much and too hard. 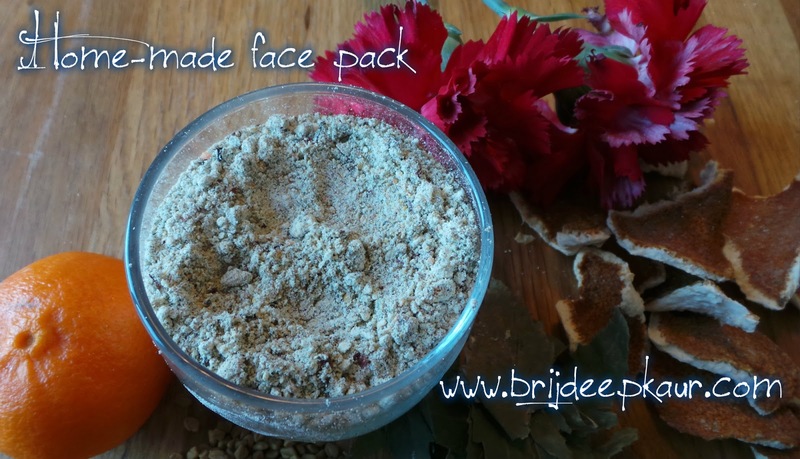 This pack also works for black heads mainly besan and orange peels powder help in removing black heads. Scrub lightly on the areas with black heads and wash with warm water. If you want to remove tanning caused due to sun, mix this pack in tomato juice and apply as a pack. Scrub and remove lightly when it's dry. Wash with lukewarm water and pat dry. It will help to remove tanning with regular use. If you are allergic to any of the ingredient, or you think it's impossible to find, you can simply skip that ingredient. You can use this mix as a face pack everyday, and as a scrub twice a week. You can use this pack for kids above 5 years. Till 5 years kids skin is very sensitive and already nice and beautiful so not required to add anything special. It will not harm in any way as it has all natural ingredients. Be careful to not apply under eyes and on the lips. It's okay to have a little coarse mix so it's really good for scrubbing and removing dead cells from the face. You don't need to grind it very finely. No water is to be added to make this pack at any stage because when you add water, it goes bad pretty fast in few days. But when all the ingredients are kept dry, it stays good for months together, you can just add milk/yogurt/water/rose water to a small portion of the powder just before applying. So, remember to keep everything DRY so it doesn't get fungus. You don't need to store this pack in fridge. Just prepare once and then transfer to air tight container, keep in your kitchen on the shelf. Just take a little bit everyday to apply. It stays good for 6-8 months. After that you can prepare fresh batch. Whole wheat flour is used in the pack as it's the best for scrubbing naturally. 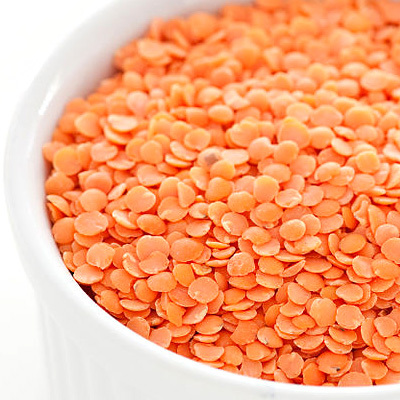 Masoor dal which is mentioned in the ingredients list is orange split masoor dal. Picture attached. A lot of people asked me why do I add both chana dal and gram flour (besan). Yes gram flour (besan) is made by ground chana dal only. But besan which we get from market is very fine as it is ground in mills, so that has been used as a base for the pack. But when you ground chana dal at home, it doesn't get the finest texture same as besan and that's why even though it has same properties (and it doesn't harm the skin), but is a little coarse which helps in the best scrubbing. Washing face with face wash before means you are using chemical face wash anyway. The best is to avoid any sort of chemicals on the face. Just before you take a shower, do apply this and wash off with lukewarm water. Pat dry. No need to wash face before with anything. Neem leaves are not curry leaves (meetha neem), it's Indian Lilac, (kadvi neem) the neem leaves that are native to India and Indian subcontinent. It helps in detoxifying the skin and lights scars and pigmentation, also helps in prevention of pimples. I picked up neem leaves from trees in India, dried them in shade and bought with me to prepare this face pack. I never buy orange peel powder. Just dry the orange peels from the oranges you eat in the shade and grind them to powder in your mixer. If oranges are not available and out of the season, dry lemon peels. They will give the similar effect as peels of fruits with vitamin C provide the cleansing effect for the skin. I have ground methi seeds in the mixer and used in the pack. 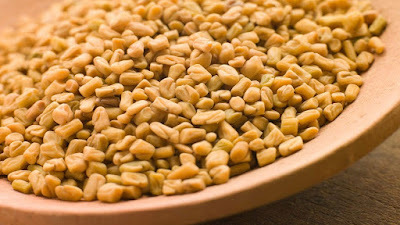 Methi seeds picture attached. It is also used as a spice in Indian cooking, also used in pickles. Rose powder: I don't buy rose powder either. I collect and dry all the roses gifted to me by my husband and then crush them into a powder. Dry in shade not in sunlight. Rose leaves are good for giving glow on the face. I have tried to answer all the queries I got till today for this face pack. If you have any more queries, please ask me so in the comment box. Also leave your beautiful comments and feedback in the comment box below so others get encouraged to use this as well. Don't forget to connect with me on FACEBOOK where I share all my food and recipes, all health and beauty posts and tips and tricks. Thanks for sharing Brijdeep..will try soon..I have open pores due to previous oily skin and acne...right now my skin is normal to dry with occational breakouts..will this pack rejevunate my skin to soft smooth texture again..
Hi dear it is a scrub which will help for scrubbing and glow instead of the normal face packs available in the market.. I will try and share more tips for open pores in skin..
you're welcome thanks so much.. Thanks for the detailed post. I am going to make it for me and my daughter and give you an update in a couple of months. sure dear do try and update me weather it worked for you.. I'm sure you will like it.. Thanks for sharing . Would like to know if we can we add ground turmeric as well ? you're welcome. Yes you can add if you want to. The oily skin face cleanser consists of plant stem cell extracts, Tocotrienol vitamin E, Noni, Blueberry and many more products that clean the face and sets the skin tone to absorb the infusion of vitamins, antioxidants and amino acids that can protect the skin texture and tone of the face. Skin is the biggest sense organ that gives the primary line of safeguard in protecting the fundamental organs of the body. The Experts of Skin Care in Houston says. To maintain the strength of the skin, general skin cleansing is the most fundamental advance took after by different medicines. Apply natural products such as natural oils like avocado, almond,olive, jojoba, coconut, Amy Adams Skin Cream or flaxseed to the skin after a shower or bath. In the event that picking the correct anti maturing skin care treatment items is essential to you, go now read on for some counsel about what to search for in the best skin creams.